It is perhaps very telling that all of the review blurbs on the back cover of Andy Partridge and Todd Bernhardt's Complicated Game: Inside the Songs of XTC are written by fellow musicians and songwriters. Andy Partridge has always been a musician's musician. 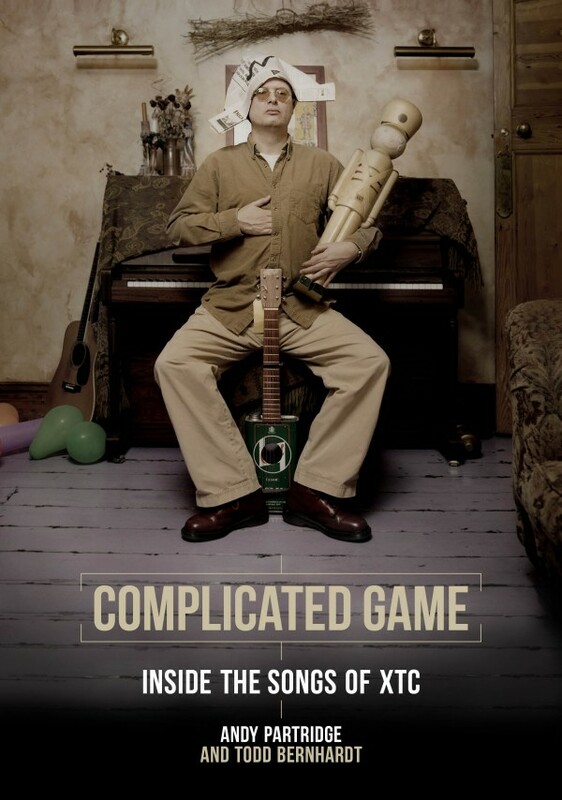 Complicated Game is a series of candid and detailed interviews with Andy Partridge about many of XTC's most well-known songs. Todd Bernhardt, the interviewer, is a fellow musician, XTC mega-fan, and friend of Andy's, so they don't shy away from discussing the nitty-gritty details of chord changes, instruments used, studio hacks, and other compositional and engineering minutia. In the chapter on "Senses Working Overtime," Andy explains how the whole song came about as he was fooling around on a new Martin guitar and he played a "messed-up E-flat." He thought it sounded very Medieval so he tried to find other chords that went with it (A-flat minor and D-flat). He says the rest of the song sort of composed itself from there. We also learn that "English Settlement" was their "new instruments record." The bandmembers had all just gotten new instruments (Andy, the Martin, Dave Gregory, a 12-string Richenbacker, Colin Moulding, a fretless bass) and they were excited to noodle around on them to see what they could do. There are many other interesting and fun revelations in the book. "This is Pop," from White Music, was Andy's way of rejecting the pigeonholing of the punk label, making sure that everyone was reminded that this is pop music, plain and simple, and that ain't a dirty word. About Wasp Star's "Church of Women," Partridge, being uncharacteristically boastful, claims that his guitar solo on that track "is as good as any Steely Dan guitar solo. There! I've said it now." In discussing the very early (1977) Be Bop Deluxe-inspired "Statue of Liberty," Andy reveals that the lyrics came to him while he was playing around with the "real Lou Reed kind of chord change" of C,G, A-minor, back to G. He looked up to see his then-girlfriend and future wife, Marianne, ironing. As she held the iron aloft in one hand, trying to untangle the cord, holding clothes in the other, her hair wild from having just washed it, she looked to Andy like some "weird, futuristic version of the Statue of Liberty." And the song was born. There are countless wonderful little gems like this throughout the book. Complicated Game also includes a walking tour of Swindon, Andy's hometown, and reproductions of original lyric sheets and some of Partridge's design sketches for album art. Jawbone Press has done a really admirable job in putting this collection together. For XTC fans, I cannot recommend Complicated Game game enough. My only criticism of it is that, given how wonderful the included song chapters are, I found myself wishing to read about some of my favorite songs that aren't included (the book features 30 songs). Bernhardt has actually conducted over 80 interviews with Partridge. You can read many more of them on the venerable XTC fansite, Chalkhills, on the Articles and Interviews page (search on the "Song of the Week" entries).